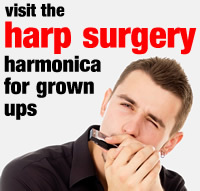 The Bass harmonica is the lowest pitched of the harmonica family and the only harmonica that just has blow notes. Like the Chord harmonica, the Bass harmonica is in two sections which are hinged together, but it’s chunkier and not as long as the Chord harmonica. The biggest Bass harmonicas have 78 single-reed notes. 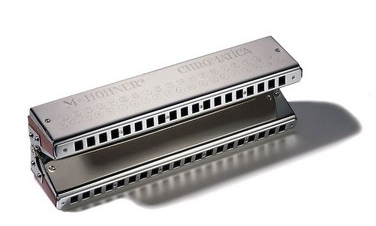 By blowing alternate holes on each section, the Bass harmonica player can move up and down in half or whole steps, just like the black and white keys of a piano. The upper section plays the black notes, the lower section plays the white notes. Here’s Jacob Venndt of Suzuki Harmonicas to show you what the Bass Harmonica looks and sounds like.